More than 500 participants attended the 8th NRW Nano Conference in Dortmund (Nov 21/22, 2018). CeNTech in collaboration with the bioanalytik-muenster network and the Alliance for Science Münster presented the nanocluster Münster at the conference. Among others Karl-Uwe Bütof from the NRW Ministry of Economic Affairs, Innovation, Digitalization and Energy visited the Münster booth. 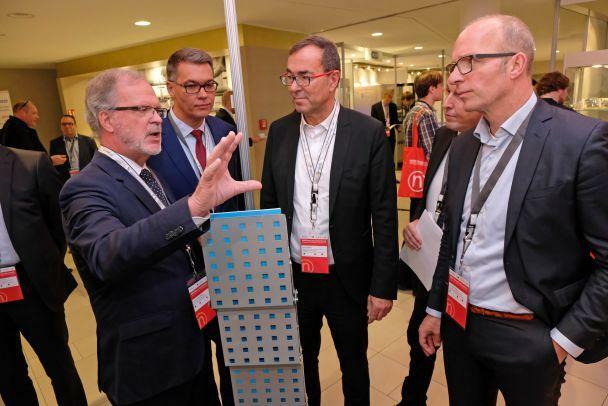 Klaus-Michael Weltring and Thomas Robbers presented and explained the Münster science park which provides an excellent infrastructure for the research and the development of nanotechnology.